Ouray Day 4 - On our last full day of ice climbing in Ouray, CO, we monopolized eight routes for the day and just climbed our hearts out. I decided to catch up with Pat, Conrad Anker, and Anne Gilbert Chase and ask them for some tips on how to be a better ice climber. I stood on the shore of Idaho's Egin Lakes, surrounded by sand dunes, watching the eclipse with my family. With a pair of eclipse glasses taped to the end of my lens and my heavy camera perched up on a flimsy gorilla pod, I would press the shutter button every 1-2 minutes. 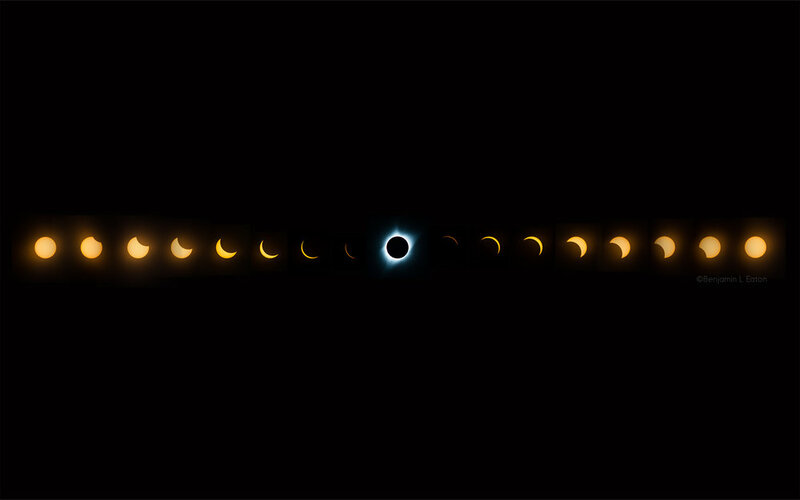 The end result, after stitching the selected photos together, is this gratifying image of the eclipse sequence...reaching complete totality. My sister told us to head to the airport at 4am where she would then send us an email with our flight itinerary. Up to that point, we had no idea where she was sending. This year, we are celebrating the 5th anniversary of the Idaho Mountain Festival. Gather your friends, make the commitment, save the date, and reserve your spot online. We settled down in our camper van under a starry night sky, resting our bodies in preparation for an amazing day of hiking through Little Wildhorse and Bells canyons--deep in Utah's San Rafael Swell Desert.